With three events in the books for OPTIMA's 2015 Search for the Ultimate Street Car, presented by Advance Auto Parts and the forthcoming announcement of three double-point events for the 2015 season, we thought it would be an appropriate time to take a first look at how the season-long points chase is shaping up this year. 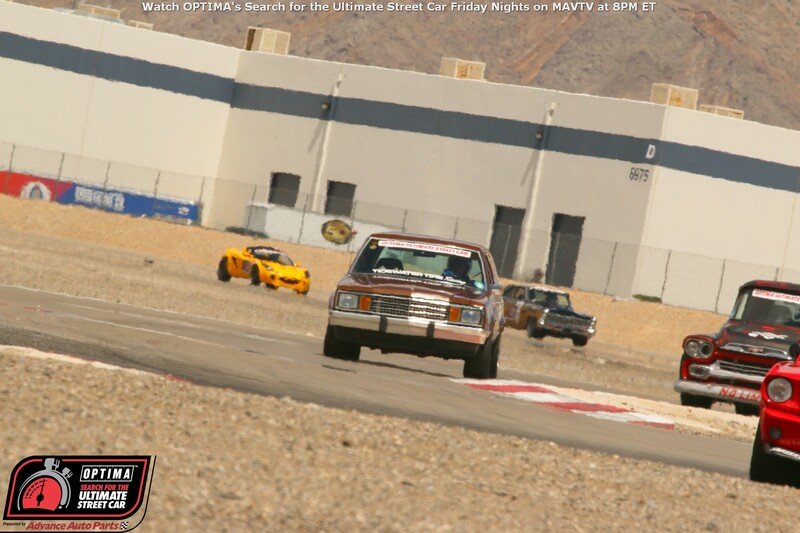 As a refresher, last season there were three different classes in qualifying events, with invitations to the 2014 OPTIMA Ultimate Street Car Invitational (OUSCI) awarded based on season-long point totals to the top contender in each of the three classes, who hadn't already qualified previously. In addition, 17 more invitations were awarded to contenders from across all three classes, who had accumulated the most points, but had also not previously-qualified for the OUSCI. That brought 20 vehicles to the 2014 SEMA Show in Las Vegas and the OUSCI based on season-long points in the series. In 2015, the class requirements were modified and a fourth class was added. As a result, invitations based on point totals were changed accordingly. The top season-long point leaders from each of the four classes, who have not already qualified, will again be invited to the 2015 OUSCI. In addition, the next 11 contenders based on points from across all the classes will be invited as well. There is also one less qualifying event this year, but the net number of invitations based on points will actually increase. In 2014, ten events offered invitations to 30 competitors across three classes for winning the event. The additional 20 invitations brought the total points-related invites to 50. In 2015, nine events offer invitations to 36 competitors across four classes for winning the event. With 15 additional invitations coming to season-long point leaders, the total number of point-related invitations in 2015 will be 51. That doesn't necessarily mean it will be easier to make it into the OUSCI field in 2015 though. Attendance through the first three events is up sharply from last year, meaning even more people are chasing the same goal. Through the first three events this year, 174 vehicles have scored points toward season-long totals. While some of those vehicles may be the same car scoring points at multiple events, it does not include one-day competitors or those moved to the exhibition class. By comparison, just 99 such vehicles had accumulated points through the first three events of the 2014 season (again, excluding participants in exhibition classes and those who did not want to compete for season-long points). The four classes have also provided more balanced fields in 2015. All but one class in every event this year has had at least eight entries. That depth in fields means the available points are more likely to be spread over a larger group of competitors. If past attendance is any indication of what we can expect in the future, qualifying events that are geographically remote or challenged to draw from a radius, like Pike's Peak and Charlotte Motor Speedway offer the best potential for smaller classes and more points, although that certainly wasn't the case for most folks at Thunderhill or Texas Motor Speedway. One thing we learned from the 2014 season that will likely carry over to 2015 is that those who make it into the OUSCI based on season-long points will likely need to compete in the equivalent of at least three events. As was the case last season, select events will also have the added bonus of being counted as double-point events in 2015- Auto Club Speedway, Michigan International Speedway and Charlotte Motor Speedway. These three venues are geographically-diverse, offering as equal an opportunity as possible for everyone in the country to make it to at least one double-point event. None of these events are coming up within the next six weeks and if push comes to shove, Auto Club Speedway is still five months away, giving someone plenty of time to plan. The season-long point totals are still based on a competitor's top-three events, so the advantage still remains for those who can make all three double-point events. However, most of those folks will have already won their way into the field. While these venues and dates may seem to favor the West coast competitors, who can sit back and watch everyone else scramble to accumulate points throughout the year, before swooping into Auto Club Speedway to add double points to their totals at the very end, that is unlikely to be the case. Charlotte Motor Speedway looks to be the best venue for someone seeking to maximize the opportunity offered by double points. It is a new venue for 2015 and the track's proximity to the Atlantic Ocean significantly limits it's ability to draw from a radius. While Auto Club Speedway does have the same geographic limitation, the fact that it is the final event will likely mean a significant number of competitors will be willing to make the long trek West for one final chance at getting into the field. Another twist to the drama is the fact that the first three qualifying events have not gone anywhere near the Midwest or East coast yet. That leaves a rather large and significant number of competitors in those regions, who have yet to run in a single qualifying event yet this year. The long list includes 2014 OUSCI competitors, Dan Ballard, Chris Porter, Sam Farrington, Greg Schneider, Rick Hoback, Justin Stone and Randy Johnson, all of whom qualified in 2014 based on points. While not all may return in 2015, others like current GTS point leader, James Forbis, have already emerged to take their place. As the points race unfolds this season, West Coast competitors may see the substantial leads they are currently enjoying dwindle away to a significant deficit by the time the Auto Club Speedway qualifier rolls around. That may make an August trip out to the Pike's Peak qualifier one worth taking for those out West. While last season was filled with speculation about what might happen, that experience has given us a fairly solid idea of what will unfold in the points chase this year. Even though we're only three events in, we think it's safe to say anyone who can't break 300 points this season will have a hard time making the field based on whatever point total they do have. However, the KN Spirit of the Event invitations are the wild card that make every upcoming qualifier an event worth attending. That is especially true for the Road America qualifier, where four such invitations will be handed out- one for each class. We can't wait to see how it all turns out and we would encourage competitors to sign up sooner, rather than later. In addition to the early-bird registration discounts, the larger fields this year have made it more likely that one or more of the qualifying events will sell out. You can sign up online at www.driveoptima.com. Click here to see the season-long point standings.